Supplied Complete with Flexible Corrugated Discharge Tube. All Pumps are Equipped with a Vent Cap on Top. These are Easy to Prime & Start Within 6-7 Strokes Pump Requires No Further Operation & Keeps Working in Auto Position. 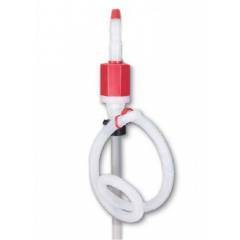 Polyethylene Pumps Siphon Liquids to Lower Levels Than the Height At Which the Pump is Installed. 2 inch bung for use with drums. Groz Siphon Pump, SPH/2 is a premium quality Speciality Pumps from Groz. Moglix is a well-known ecommerce platform for qualitative range of Speciality Pumps. All Groz Siphon Pump, SPH/2 are manufactured by using quality assured material and advanced techniques, which make them up to the standard in this highly challenging field. The materials utilized to manufacture Groz Siphon Pump, SPH/2, are sourced from the most reliable and official Speciality Pumps vendors, chosen after performing detailed market surveys. Thus, Groz products are widely acknowledged in the market for their high quality. We are dedicatedly involved in providing an excellent quality array of Groz Speciality Pumps.